This year, we kept things pretty simple for St. Patty's Day. I usually love to have things all decorated, have a bunch of kiddos & moms over for a green lunch and go all out, but not this year! Too much going on already and no house to do it in. However, TJ did get to make his very first leprechan trap. I know a lot of moms hate the things, but it was the first time in a long time that TJ and I got to spend some special time together. (More on that in an upcoming post!) TJ loved it! Sometimes, he's not really in the mood to be crafty, but on Wednesday, he was in a super crafty mood! Very intently glitter-gluing his box! St. Patty's Day was a lucky day for us in an completely non-green way as well. We had our checkup with the OB/GYN and we actually got to see him! He was called away the last 3 times I had an appointment! Not only did we get to see him, but we got to find out if we were having a boy or girl. No matter how much I said I'd be excited to have a boy, I was REALLY hoping for a girl this time! And, I'm happy to say, my wish was granted! I FINALLY get to think pink and ruffles and frou frou!! Yay! You may or may not know this about me, but I LOVE to read. I love reading pretty much anything, from autobiographies and how-to's to historical novels, even the occasional slightly trashy romance novel. (Nothing too trashy, just an easy, mushy read!) Although I love to read, I don't buy many books and here's why. 1. I'm cheap/poor and books are expensive! 2. I have nowhere to keep the books and I hate dusting! In order for me to keep a book, it has to be something I LOVE and will read repeatedly or a book I'll use over and over, like a reference book. 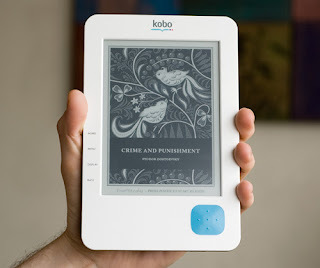 Its a Kobo e-reader and I love mine! There's only one problem. When I read a book, I get REALLY into it! Often, I can't put them down, even if its not an amazing book! I just kind of lose track of time. And then I ignore my life and its just no good! This problem didn't occur nearly as often when I had to drive into the library in Lethbridge (the Raymond one doesn't have great selection!). Now, however, its happening too frequently! In the last week, I've read Pride & Prejudice, a mystery by Agatha Christie & a trashy romance. My house is still relatively clean and my kids are getting fed, but not too much more is happening! Granted, I was really sick this past week, so I wouldn't have done much else anyway, but really!